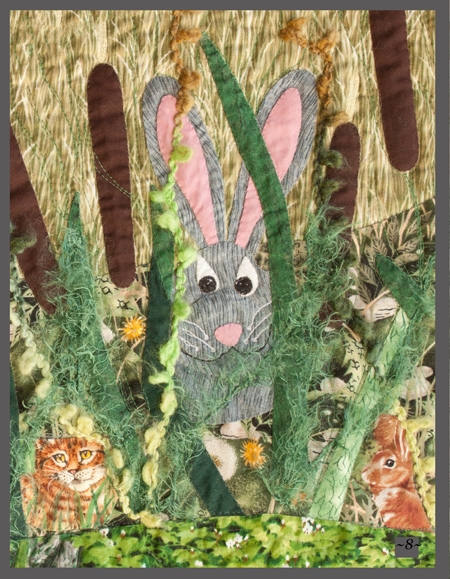 Guest blogger, Joan Musick, quilter, author, illustrator, and pattern maker. Quilting is my passion and writing is my hobby. These two loves came together in an unusual way for me. It started with the true story of my neighbor who had a problem with her garden. Her flowers were being taken…just the tops…and she was baffled as to where they were going. After some debate, I suggested to her that maybe a furry critter was eating them, and we laughed and decided the mystery was solved. The situation tickled my funny bone so I wrote it down as a children’s mystery story. Then I thought, “What about the critter?” He had a story too, so I tried to think like a hungry and curious bunny to see his perspective. Of course, both stories involved a dog and a fantastic chase with a narrow escape. Once the stories were written, it just seemed a natural progression for me as a quilter to accompany these words with a fabric landscape picture, so I started designing small scenes as illustrations. Wonderful fabrics presented themselves and begged to be included. As I worked on each scene, ideas for the next one came to my mind. 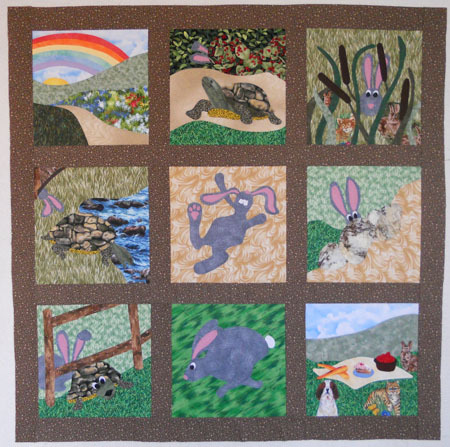 Before long, I had fourteen appliqued scenes that combined to make a large bed-sized quilt. I also used nubby yarns and fluffy textured threads to embellish portions of each scene. So now what? I had two stories and a quilt. It seemed logical to combine the two stories into a double-sided “flip-me-over” book. I found a publisher in my home town: Mother’s House Publishing in Colorado Springs, Colorado. We photographed the quilt in detail and used computer magic to create the children’s book The Missing Flower Tops / The Midnight Snack published in April 2011. Each page features full-color photos of my quilt. The fabrics, threads, and textures can be seen right up close. By the time this storybook was published, I had ideas for many more stories. 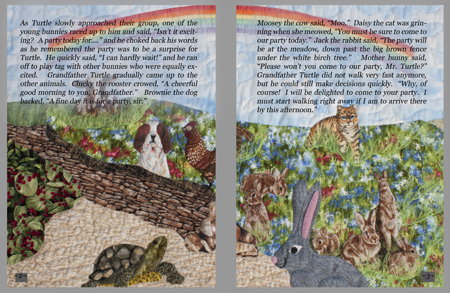 The fable of the tortoise and the hare came to the surface as the next idea I wanted to work on, so I designed another large bed-sized quilt to interpret this story. It tells about Grandfather Turtle’s 110th birthday and a surprise party. 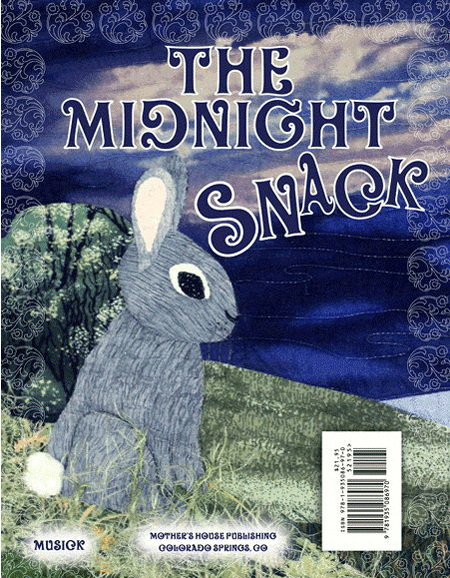 A silly bunny who needs lots of naps on his way to the birthday party completes the other side of the book. It was entirely appliqued, lightly embellished with textured yarns, and heavily quilted. As before, when the quilt was finished, we took detailed photographs of it and used computer magic to lay the words onto the pictures. My second book, A Surprise For Turtle / The Happy Nappy Day was published in May 2012. Included in each storybook is a photo of me and my BERNINA sewing machine. 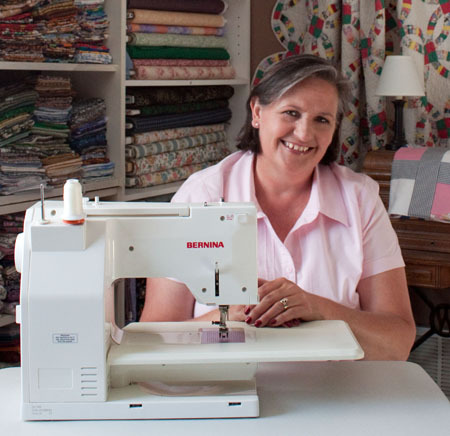 I have used a BERNINA 1080 sewing machine since 1995 and learned how to do turned-edge applique using the sewing machine, freezer paper, invisible (clear) nylon thread, and a blind hemstitch. 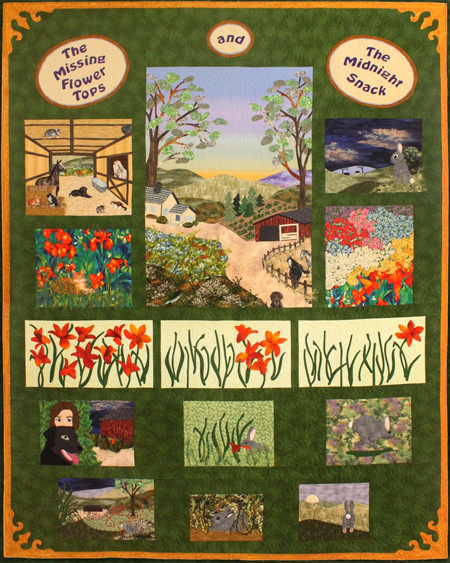 This applique technique was first pioneered by Harriet Hargrave of Wheatridge, Colorado, and is featured in her book Mastering Machine Applique. I do all of my own free-motion quilting on my BERNINA using a darning foot. I also appreciate the ease with which I can quickly change the stitches and feet to suit my purpose. Mirror-imaging is also a stitching function I use frequently. My next book will be another appliqued work featuring a boy and his dog. On one side, we see all of the wonderful things that Marvin imagines he is doing. On the other, his dog “Ruffie” sees what is really happening. It is due out in the spring of 2013. Since my storybook quilting adventure began, many people have asked for patterns so they could make a quilt to accompany the storybook they bought for their child. Since my large quilts are complicated (and many of the fabrics are no longer available), I created patterns for a child-sized nine-block quilt to go with each book. 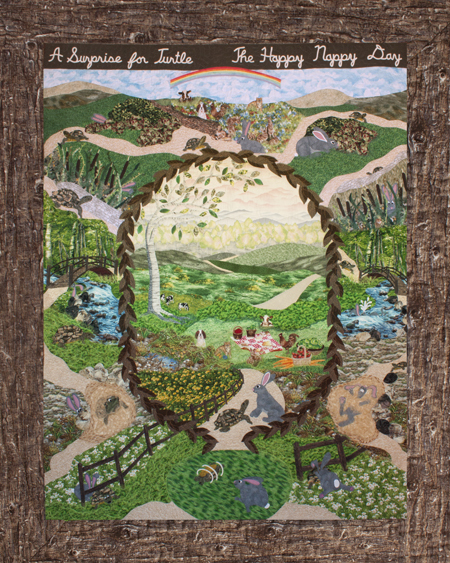 The patterns feature the main characters and scenes of each story and are designed to be appliqued in any technique desired. 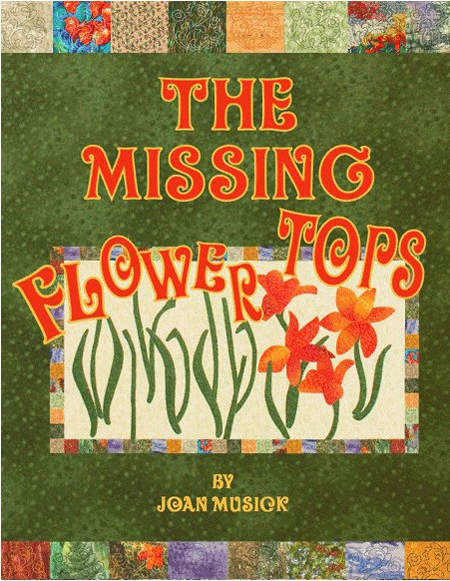 Please visit my website at www.joanmusick.com where you may purchase your own copy of my books and patterns. Joan started sewing as a young teenager, making her own clothing and later creating her own wedding dress. 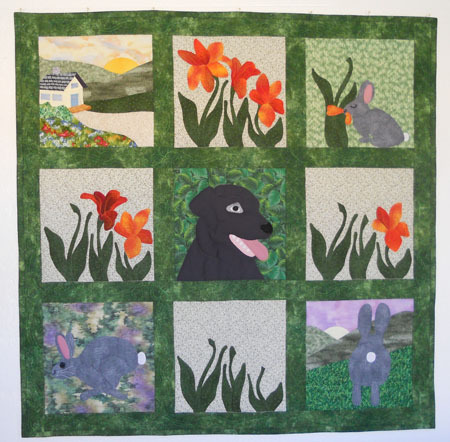 She made her first quilt in 1980 and has been an avid quilter since that time because “quilts are hugs that fit everyone.” She lives in Colorado with her husband, two grown sons, and a variety of furry critters.